ZEELAND -- Mary Jane Vander Weide was 7 years old in the summer of 1937, when she played the piano during a talent competition held in conjunction with the dedication of the Lawrence Park Bowl. Vander Weide is thrilled to see that the city has renovated the amphitheater, which will host a four-week summer concert series that kicks off Tuesday night. The $220,000 project includes new barrier-free concrete ramps, 200 plastic molded seats that have been installed for spectators, new landscaping and new sound and lighting equipment. However, perhaps the most important part of the renovation was the work on the Bowl itself. 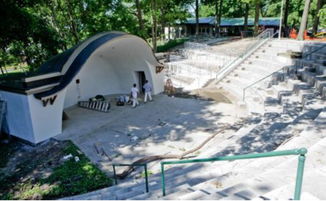 The amphitheater, built during the 1930s, was in need of updating. "It was significantly deteriorated," project architect Andrew Baer said. When it was originally dedicated, Vander Weide was center stage. 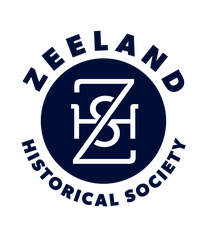 "You came in from one side and you walked out onto the stage," said Vander Weide, a Zeeland Historical Society member and former director of the Dekker Huis Museum. "I thought (when I walked out) 'oh my goodness.' I was flabbergasted that the seats were packed." Vander Weide won her age-group competition and still has the prize from that event -- a Shirley Temple wicker doll buggy. Set at the bottom of a wooded hill, just west of the downtown area, the bowl was built as part of a federal Works Progress Administration project at Lawrence Park in the mid-1930s. "You had to use local people (for the work)," Vander Weide said. "It was there to help employ the unemployed in the city." After its construction, the bowl became popular for concerts, church programs and other activities. Mayor Les Hoogland remembers going to movies at the park as a child. "I'd watch Frank Buck in 'Bring 'Em Back Alive,'" said Hoogland, recalling the famed adventurer of the 1930s and 1940s. In recent years, the bowl started to fall into disrepair. The city spent nearly $42,000 to renovate the bowl's concrete seats about a decade ago and City Council approved the renovation earlier this year. Hoogland says he wants to pursue having the bowl designated a state historic site, an idea first suggested about 10 years ago by former City Manager David Baron. The summer concert series is free, but the Zeeland schools' athletic boosters will hold a chicken barbecue (tickets $7 required in advance) at the Tuesday and July 28 concerts. The Bridge Youth Ministry will sell hot dogs and refreshments at the July 14 and 21 concerts. Tuesday -- Tarnished Brass Band, 6 p.m.; The Junior John Band, 7 p.m.
July 14 -- Micah Vauteau, 6 p.m.; Common Shiner, 7 p.m.
July 21 -- Man Against Society, 6 p.m.; That 70's Cover Band, 7 p.m.
July 28 -- Small Rain, 6 p.m., The What Not Band, 7 p.m.